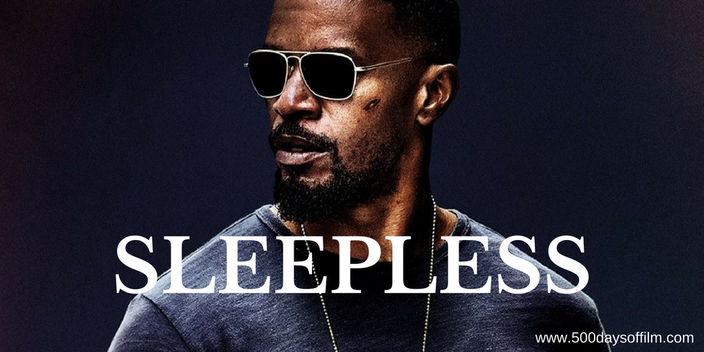 Vincent Downs (Jamie Foxx) is an undercover Las Vegas police officer caught in a high stakes web of corrupt cops and a mob-controlled casino underworld. When a drug heist goes wrong, Downs’ teenage son is kidnapped. Click Here For A Free Weekly Film Magazine! impressive cast (Jamie Foxx and Scoot McNairy are particularly wasted here), this is not a good movie. I knew I was in trouble from the opening scenes when the score started to pound. Now it’s time to feel tense it seemed to shout. Look, here are the bad guys! Honestly, I haven’t heard a more unsubtle soundtrack in a long time. Then came the story. Sleepless is farcically derivative. It reminded me of many (far) superior movies that I would have preferred to be watching (Die Hard and The Raid to name but two). Its plot is ridiculous (I almost laughed out loud twice and not in a good way), its script is dire and don’t even get me started on the film’s nausea-inducing editing. I get that not every film needs to be a masterpiece. I understand the value in movies that are fun and entertaining even as they are instantly forgettable. Sleepless, however, does not even fall into this category. Don't get me wrong, this movie is not offensive, just dull and definitely one to avoid. If you have, what did you think of this movie? Let me know by leaving me a comment in the box below or come find me on Twitter or Facebook!